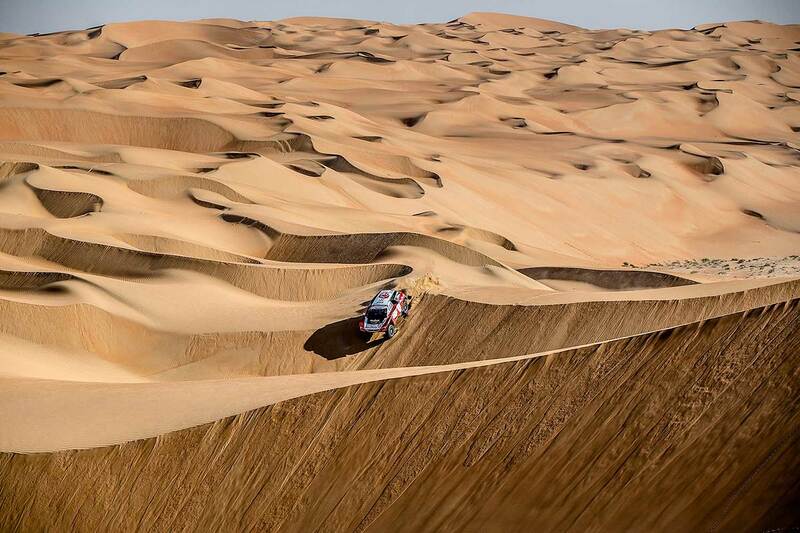 What a crazy SS04 "ADNOC" in the dunes of Abu Dhabi: Many retirements in the cars and some surprises - and again a tough fight during the best brought again some changes inside the Top 10 - and also some new faces including two T2-production cars. On the top today we saw a nice fight especially between the Ford of Martin Prokop, the Buggy of Cyril Despres, the two X-raid Minis of Vladimir Vasilyev and Jakub Przygonski and the Peugeot of Sheik Al Qassimi, who finished only some minutes from eachother. Finally Martin Prokop and David Pabiska could manage again a stagewin with their Ford F150 Raptor Prototype in 03:29:55 hours, followed only 31 seconds by Cyril Despres and Steve Ravussin in their SMG Two Wheels Drive Buggy and the today´s third Vasilyev / Zhiltsov from Russia in their private operated X-raid Mini (+6:40 minutes). 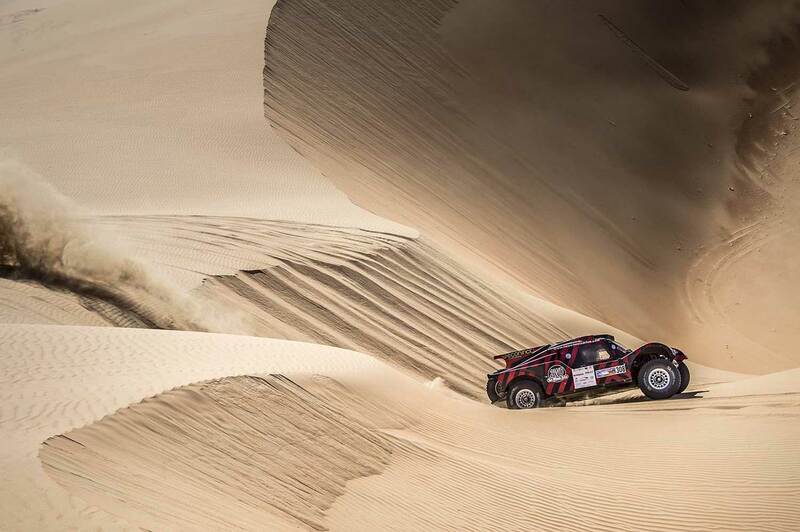 The Top 5 were completed by Przygonski / Colsoul in the "official" Orlen-Team X-raid Mini (+6:40) and local Sheik Khalid Al Qassimi with French navigator Xavier Panseri in the Peugeot 3008DKR (+7:26). "It was an ok day, but tough," said Martin Prokop, who could extend his overall lead to Jakub Przygonski with now 15:20 minutes today. "We made many mistakes going up the dunes, meaning I had to go around and try again. The feeling in the car was not good. It took a long time to get the right rhythm. It was really tough today." 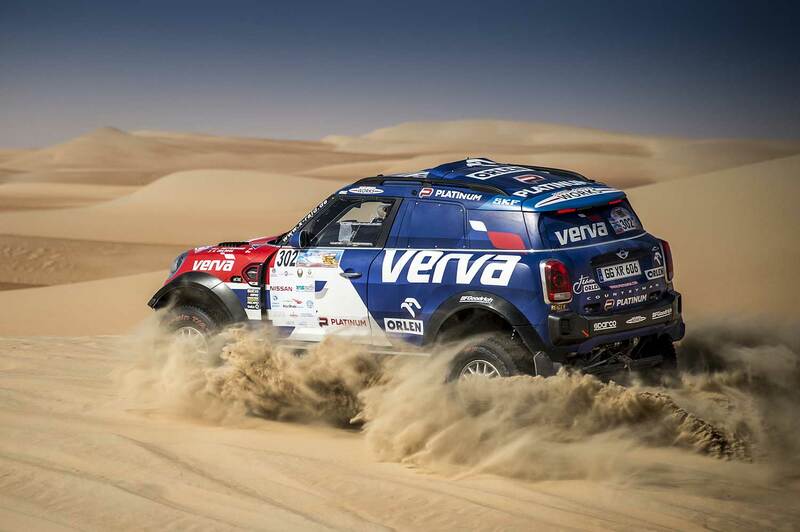 Vladimir Vasilyev, who scored back-to-back Desert Challenge victories in 2014 and 2015, could climb the 3rd position overall today behind the Pole Przygonski with a gap of 48:59 minutes to the leader Prokop. "That was a good stage, but we had a slow puncture for the last 30 km which made the car very bouncy." Former 3rd Al Qassimi moved to 4th position with +53:20 mins. Behind them, the distances in the overall standings become more comfortable for the leaders. Cyril Despres as 5th has a gap of 01:38:10 hours, surprisingly 6th Stephan Schott from Germany (X-raid Mini) +02:57:06 hours and new 7th Al Feraihi / Al Sanad from Saudi Arabia +03:20:31 hours. In his Rallyraid-debut and first time on four wheels in the Desert, the former KTM Motorsport Boss Chris Rosenberger today could finish the stage with his X-raid Mini on 10th position which brings him in the overall Top 10 as 8th. 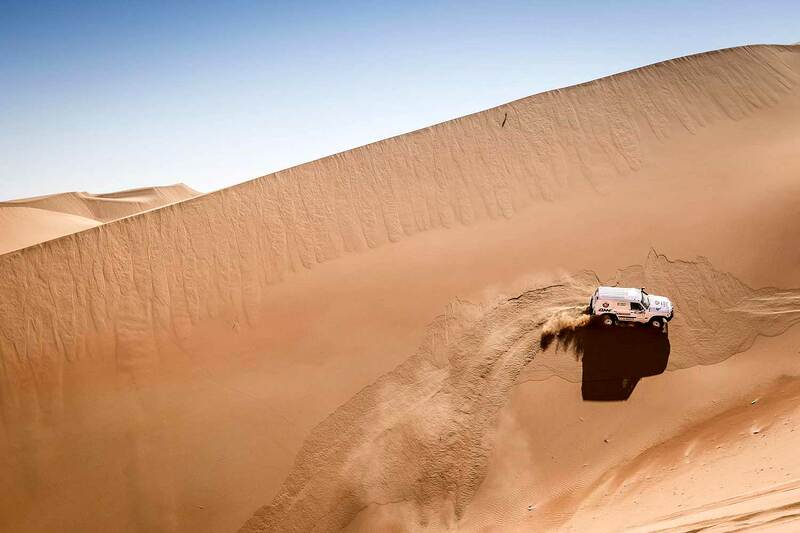 Saudi Arabia’s Ahmed Al Shegawi with French co-driver Laurent Lichtleuchter in a Toyota Landcruiser are within reach of the T2 production cars title, leading by more than 57 minutes from Qatar’s Adel Abdulla and Naser Al Kuwari in a Nissan Patrol, lying 9th and 10th in the overall rankings. There was bitter disappointment, however, for the UAE’s Yahya Al Helei and Khalid Al Kendi who were sixth overnight in a Nissan Pick Up but retired with mechanical problems - and except the Nissan Navara of Bell / McMurren, who finished 9th today, it was again also a bad day for the new Red-Lined Nissan Navara from South Africa. In the SSV category, Spain’s Jose-Luis Pena Campo and Rafel Tornabell in a Polaris go into the final leg holding a lead of 20:44 minutes from UAE-based Michel Fadel and Craig Tyson. "We’ve had four days of classic cross country rallying across some of the most dramatic and challenging desert terrain on earth," said Mohammed Ben Sulayem, President of the Automobile and Touring Club of the UAE and Emirates Motorsport Federation. "With just the final stage left no-one can afford to relax and risk making any mistakes. We’ve seen the lead changing hands on the last day so many times in the past."